As a Northeastern professor, I’m certainly aware that many of our students live in less-than-ideal conditions. But to the extent that I’d given it much thought, I had assumed the squalor was largely of the students’ making (see this, for instance), compounded by greedy landlords who pack too many residents into their buildings. According to The Boston Globe’s just-completed series “Shadow Campus,” that may be true, but it’s just the beginning. From Sunday’s account of a fatal fire, to Monday’s story on hazards elsewhere in the city, to today’s profile of landlord-from-hell Anwar Faisal, the series, by the paper’s Spotlight Team, documents the dark side of Boston’s student-fueled economy. The series was many months in the making, and (full disclosure) was reported in part by student reporters, including some from Northeastern, who are not identified in the story. Certainly the large universities in Greater Boston — particularly Boston University, Boston College and Northeastern — will be challenged to build more on-campus housing. Given the failure of the city’s overwhelmed inspectional services to do better, the story also removes a bit of a shine from former mayor Tom Menino’s legacy and puts Mayor Marty Walsh on the spot. 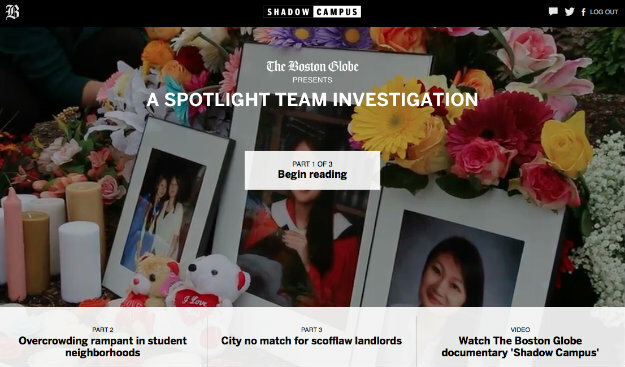 Online, “Shadow Campus” has all the multimedia bells and whistles we’ve come to expect with long pieces: a beautifully designed, easy-to-read layout; lots of photos and video clips; and official documents the Globe dug up in the course of its reporting. Overall, a very fine effort. More: Here’s a complete list of everyone who worked on the series. Student reporters are listed under “Correspondents,” though not everyone in that category is a student.